Entering to win the Ed Hardy lotion! I cant wait to try the JWOWW!! I like Ed Hardy Love Kills Slowly. I subscribed to blog feed by reader. my favorite product that i would love to try is California Tan HD FAB Step 1 Dark Tan Builder Tanning Lotion – 7 oz. I like the California Tan SPF 8 Outdoor Dark Tanning Lotion. I am entering for the Ed Hardy Lotion. I am using Queen by designer skin and it is so far amazing. A light perfume sent makes me smell nice! I would like the Fiesta Sun DARK CHOCOCOLATE TINI Dark Tanning Cocktail – 12.5 oz. i love LUMINARY! thats probley my favorite lotion at the moment, im dieing to try this ed hardy one though as i am a HUGE ed hardy fan. i just bought a tanning canopy and would love to win this!=) thanks! I like the Sperti Facial Tanner, would be nice in the winter. I love the Ed Hardy products! Any of them! I am entering again for the Ed Hardy lotion! I am going to try the JWOWW tomorrow and I cant wait its smells yummy! Fiesta Sun PINK PINEAPPLE TINI Dark Tanning Accelerator Cocktail looks pretty cool!! Posted on my blog about this contest. I love Ed Hardy’s Love Kills Slowly tanning lotion. I subscribe by blog reader. My favorite right now is Devoted Creations Haute Couture. Luminary by Designer Skin is still one of my favorites. So Ive narrowed it down as best as I can. I guess I’m “experienced” and know what I like so here it (they) are, lol. I love Designer Skin “Goddess” and “Bombshell” also love Ed Hardy “Body Shots” and “Ghost Skull” Im a sizzle girl but love anything with a nice bronzer in it as well. Love tanning and everything associated with it. THANK YOU!!!! Love the Body Drench face spray. Works well. The UV Free Sunless Tanning Lotion. So I’ve mentioned on here my love for tingle lotions but now I’m posting for after tan moisturizers. It’s important to use them especially for me living in such a dry climate. I loved Kiss Me by Australian gold but now lean toward the microbeads like Devoted Tans Love my Couture Tan. They are many great ones and Tanforless has an AWESOME selection of them! Thank you-Melissa Warner. i love the Swedish Beauty BE LOVED Advanced Bronzing Serum Tanning Lotion – 8.5 oz. I’d also like to try Go to Black. mandaory entry: my fav product on tanforless is Devoted Creations Pout Couture Plumping Lip Gloss – 0.27 oz. I became a fan on facebook & have subscribed also. My facebook user name is “LIL B”. 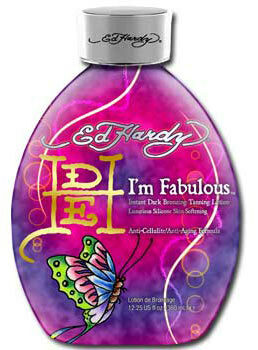 Would LOVE to win the new ED HARDY ‘IM FABULOUS’ LOTION. HAVE ‘BODY SHOTS’ & LOVE IT!! I tried the JWOWW and loved it! I love designer skin lotions especially! I like the Australian Gold Dark Tanning Accelerator Lotion. I wanna try this as well as Tan Inc. TORQUE Ultra Dark Energy Infused Tanning Lotion for MEN – 13.5 oz. i like the Emerald Bay SUN LUVIN Triple Shot Bronzers Tanning Lotion – 9 oz.